GÉRIN-LAJOIE, ANTOINE, journalist, lawyer, writer, and public servant; b. 4 Aug. 1824 at Yamachiche, Lower Canada, son of Antoine Gérin, dit Lajoie, and Amable Gélinas; d. 4 Aug. 1882 in Ottawa, Ont. Antoine Gérin-Lajoie was so strongly attached to his native land that in introducing him one must first evoke the bit of it his family occupied and owned. His great-grandfather, Jean Jarin (Jarrin or Gérin), who originally came from the diocese of Grenoble, France, arrived in Canada around 1750 as a sergeant in the colonial regulars and took part in the Seven Years’ War. He subsequently settled in the region of Yamachiche. His high spirits and good humour earned him the nickname of “Lajoie,” which was added to his family name. This surname was not, however, used by all his descendants. 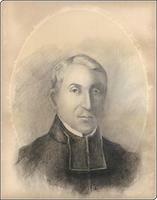 Thus two of Antoine Gérin-Lajoie’s brothers, Elzéar Gérin and Mgr Denis Gérin, did not adopt the full surname; nor did four of his five children. The Gérins were diligent and prosperous farmers in the Yamachiche region. 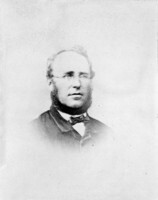 Antoine Gérin-Lajoie’s parents cultivated a stretch of land in the concession of Petites-Terres, on the south side of the King’s Road Rooted in his native soil, Antoine admired his parents, work on the land, and the traditional values of which he saw himself as both beneficiary and guardian. The eldest of 16 brothers and sisters, he was a quiet, obedient, and sensitive child. At the age of eight he was attending the village school, where he obtained “a number of prizes and a great many compliments.” He then entered a secondary school in Yamachiche, where he learned a little Latin. When the local parish priest, Sévère-Nicolas Dumoulin*, suggested that he should receive a classical education, his parents proudly agreed. In 1837 he entered his second year (Syntax) at the Séminaire de Nicolet. At that time the seminary was one of the most respected institutions of secondary education in Lower Canada. 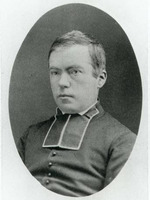 Abbé Jean-Baptiste-Antoine Ferland*, a director, quickly became a friend of this impressionable and gifted pupil who surpassed his classmates in talent, creativity, and achievement. Antoine had a passion for literature and by the age of 15 had begun to write poetry. 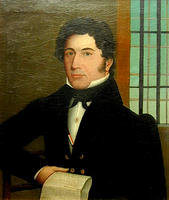 One evening in 1842, when he was in his, sixth year (Rhetoric) at the seminary, he composed a song in memory of the Canadians deported to Australia after the 1837–38 rebellion; called Un Canadien errant, and put to the tune of Par derrière chez ma tante, it was taken up by the whole seminary. The song spread throughout Canada East, and was to remain one of the most popular ballads in Quebec. 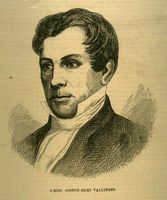 Shortly after, Gérin-Lajoie founded a literary and debating society, becoming its secretary and leading spirit, and with classmate Raphaël Bellemare he edited a weekly paper, Le Moniteur (Nicolet). Towards the end of his school years, he composed a three-act tragedy in verse, Le jeune Latour; one of the earliest plays in French Canadian theatre, it was given a special performance in July 1844. In the style of Corneille, the drama is set at the time of the conquest and deals with the conflict between a young Canadian officer, who is holding an Acadian fort for the French, and his Anglophile father. It was reprinted in L’Aurore des Canadas and brought him further celebrity. This formative period in Gérin-Lajoie’s life reveals what would later be his concerns, and also his disillusionments, hesitations, and renunciations. He was idealistic and sensitive, as imaginative as he was talented; from the moment he left the seminary he was caught up in utopian fantasies – for instance he dreamed of going to Paris for 15 or 18 months to study literature, politics, and journalism, then returning to his country to start a French newspaper and play an important role in politics. His first attempts were disappointing. He contemplated taking a diploma in law, but decided to try his luck in the United States with a friend, Guillaume Vassal, and hoped to find a teaching post there. He left on 13 Aug. 1844 with $15, and was back 17 days later; he had been to New York, Stoningen (Mass. ), Providence (R.I.), and Boston, but had encountered only refusals and polite advice to return to his own country. Then began what would be the most dynamic and laborious four years of his youth. Having first knocked on several doors without finding a job, Gérin-Lajoie joined La Minerve in 1845. This liberal and democratic paper corresponded to his ideology and, although he was simultaneously proof-reader, translator, and occasional writer, he felt honoured to be working in the office where Augustin-Norbert Morin*, Louis-Hippolyte La Fontaine*, and Léon Gosselin* had “wielded the pen.” His weekly salary was, however, hardly adequate: first 2 piastres, then 3, and then 5, a ceiling never exceeded during his two and a half years with the newspaper. His clothes were so shabby that he did not dare to walk around town in daylight, much less to appear in society. Despite adversity he was able to sense opportunities which would enable him to realize the patriotic ambitions he cherished. Having started a literary society at college, he now decided to set up a similar one for French Canadian society. In 1844 he proposed the founding of the famous Institut Canadien of Montreal and became its first secretary; he delivered several addresses to the members and was elected president in the summer of 1845, serving until November 1846. He was also appointed secretary of the Association Saint-Jean-Baptiste in Montreal in April 1845 and retained this post for several years. 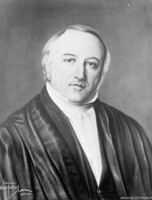 Abandoning journalism towards the middle of 1847, Gérin-Lajoie devoted himself to the study of law, at the same time maintaining a close interest in politics. 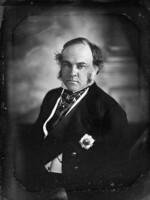 An unwavering admirer of La Fontaine, he was opposed to the Conservative government of Henry Sherwood* and Denis-Benjamin Papineau*, formed in May 1847 under Governor Lord Elgin [Bruce*]. When the ministry failed to win the support of French Canadians, elections appeared inevitable. 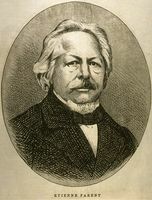 In order to ensure the defeat of Joseph-Édouard Turcotte*, the candidate in Saint-Maurice County, Gérin-Lajoie initiated political meetings to secure the nomination of Louis-Joseph Papineau*, who had returned from Europe two years earlier. In the elections held at the end of 1847 and the beginning of 1848 the government lost to the Reformers; La Fontaine was called to form the new ministry, the first responsible government. Gérin-Lajoie’s brief political adventure had lasted long enough for his liking. Having completed his legal studies, he was called to the bar on 20 Sept. 1848 and opened a law office. Nevertheless, rightly or wrongly, he did not believe he possessed the gifts that make a good lawyer. “I like the study of law,” he remarked, “but chicanery and trials thoroughly bore me.” In January 1849 he accepted his first post in the public service, becoming a transcriber in the Department of Public Works and subsequently, in April, treasurer and paymaster. Gérin-Lajoie belonged to the first generation of French Canadian intellectuals to find themselves drawn to the public service. 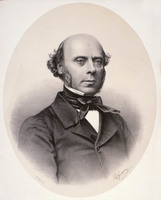 From then on, as his son Léon Gérin* wrote, he was “an intellectual in abeyance,” by turns a ministerial or editorial secretary, political writer, and public servant in various capacities. Yet he contemplated settling near Nicolet and becoming “an educated farmer.” “Ah, if I were a farmer! . . . ,” he exclaimed, at the beginning of his “Mémoires,” a kind of journal to which he confided his desires, whims, and memories from 1849 until his death. He also thought once more of going to Paris, becoming a journalist, and “trading in books” there. In 1850 he prepared a short documentary work on Canadian political institutions, which he published in 1851 under the then fashionable title of Catéchisme politique. The sub-title, Élémens du droit public et constitutionnel du Canada, mis à la portée du peuple, clearly indicates the book’s content and purpose. 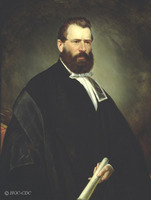 In 1850, when the seat of government had been transferred to Toronto after the burning of the parliament building in Montreal the previous year, Gérin-Lajoie decided to resign from his public works post. 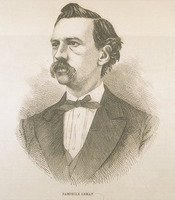 After briefly practising law, he returned to the Department of Public Works as a secretary to provincial adjudicators and then in September 1851 made a second trip to the United States, to study English. 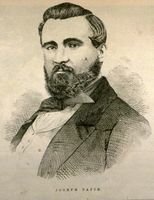 A few months after his return, finding himself obliged to “earn his living,” Gérin-Lajoie accepted in November 1852 a post as supernumerary in the translators’ office of the Legislative Assembly. (The government had recently moved to Quebec.) On 24 Sept. 1854 he was appointed a translator. 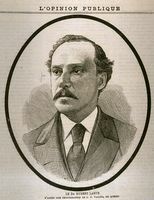 The following year, after the assembly recommended a second transfer of the seat of government to Toronto, Gérin-Lajoie reluctantly moved to that city. On 31 March 1856 he was appointed deputy librarian of the assembly, with special responsibility for the French section of the library. Undertaking this task with single-minded devotion, he assembled the first Grand catalogue raisonné of the library, published in 1857. “Learned and helpful as a Benedictine,” as Alfred Duclos* De Celles described him, he always made an effort to place his vast and unpretentious erudition at the disposal of parliament and of those who came to consult him. In Toronto he met Étienne Parent* and a firm friendship developed between the two men. Parent had been under-secretary of the Province of Canada since 1847 and, having spent the winter of 1855–56 alone, decided to bring his family to Toronto in May. They lived in the same boarding-house as Gérin-Lajoie, who met the eldest of Parent’s three daughters, Joséphine-Henriette, and on 26 Oct. 1858 married her in St Michael’s Cathedral, Toronto. The seat of government was again transferred to Quebec during the summer of 1859. Gérin-Lajoie’s next six years there coincided with the first noteworthy phase of French Canadian literary history. It was the period of what has been called the “Quebec School,” with which Gérin-Lajoie was intimately associated. In poet Octave Crémazie*’s bookshop on Rue de la Fabrique, men who already had or would acquire a name in politics, history, and literature met regularly. Among them were Étienne Parent, François-Xavier Garneau*, Abbé Ferland, Pierre-Joseph-Olivier Chauveau, François-Alexandre-Hubert La Rue, Joseph-Charles Taché*, and a young priest, Abbé Henri-Raymond Casgrain*. Garneau’s Histoire du Canada depuis sa découverte jusqu’à nos jours, published between 1845 and 1848, had already impressed them, and Abbé Casgrain had no difficulty in convincing them of the necessity for a French Canadian literature. On 21 Feb. 1861 they founded a journal that Gérin-Lajoie had planned, Les Soirées canadiennes (it lasted until 1865). Soon after, a second journal was launched, Le Foyer canadien, which remained in publication from 1863 to 1866. 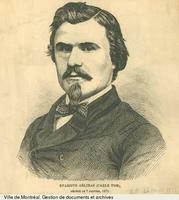 It was in Les Soirées that Gérin-Lajoie published the first part of his novel Jean Rivard, le défricheur canadien in 1862, and in Le Foyer that the sequel, Jean Rivard, économiste, appeared in 1864. This work now seems too rhetorical and apologetical. But it struck a chord among contemporaries, for its message responded to their hopes. Indeed it was precisely in this that its real merit lay. The story is well known: the hero of the novel, Jean Rivard (the surname of the spouse of Gérin-Lajoie’s grandfather, Ursule Rivard-Laglanderie), goes off into the dense forests south of Lac Saint-Pierre to set up a village (that is, a “small republic”) which he will head and which could be a religious, educational, economic, and political model for French Canadians. Much of the novel consists of correspondence between Rivard and a former college friend who practises law in Montreal, Gustave Charmenil (Gérin-Lajoie believed this was the surname of the wife of his maternal ancestor Jean Gélinas). Charmenil’s letters, even more than Jean Rivard’s, exalt the virtues and dignity of rural life. “There have always been two men in me,” Gérin-Lajoie had written at the beginning of his “Mémoires”; it seems not unreasonable to suppose that Charmenil is a barely veiled portrait of the man Gérin-Lajoie must have been, while Jean Rivard is the incarnation, almost to the point of myth, of the ideal person he would have liked to become. In any case, for three-quarters of a century Jean Rivard was a classic of the ideology of both church and state, which extolled the prime importance for French Canadians of a rural destiny. It also brought Gérin-Lajoie his most widespread fame. [The most comprehensive bibliography of Antoine Gérin-Lajoie’s literary output and of secondary works dealing with him is in René Dionne, Antoine Gérin-Lajoie, homme de lettres (Sherbrooke, Qué., 1978). Many of Gérin-Lajoie’s letters and unpublished writings, as well as some other documents, are held in various archival repositories, including ANQ-Q, PAC, ASJCF, ASQ, the National Library (Ottawa), and the Centre de recherche en civilisation canadienne-française (Université d’Ottawa). 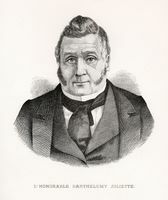 In addition to the articles (generally unsigned) that he wrote as a reporter for La Minerve (Montréal) from 1845 to 1849 and in 1852, Gérin-Lajoie published many lectures and articles in Canadian periodicals and newspapers in the 1840s, in particular in the Revue canadienne (Montréal). His other most noteworthy works are: Le jeune Latour, a three-act tragedy which was published in L’Aurore des Canadas (Montréal) on 10, 13, and 17 Sept. 1844, in Le Canadien (Québec) on 16, 18, and 20 Sept. 1844, and also as a small book in 1844 and in 1848 in Le Répertoire national, ou recueil de littérature canadienne (Montréal), edited by James Huston*; “Éloge de l’honorable Joseph Rémi Vallières de St. Réal, juge en chef du district de Montréal,” an address delivered to the Institut Canadien de Montréal on 25 Feb. 1847, which was published in the Album littéraire et musical de la Minerve in 1847; Catéchisme politique; ou élémens du droit public et constitutionnel du Canada, mis à la portée du peuple . . . (Montréal, 1851); Jean Rivard, le défricheur canadien, first published in Les Soirées canadiennes (Québec), 2 (1862): 65–319, and reissued in numerous editions in the period up to 1958, either by itself or with Jean Rivard, économiste. The latter, a novel, was first published in Le Foyer canadien (Québec), 2 (1864): 15–371. Gérin-Lajoie also wrote “L’abbé J.-B.-A. Ferland,” Le Foyer canadien (Québec), 3 (1865); i–lxxii; Dix ans au Canada, de 1840 à 1850; histoire de l’établissement du gouvernement responsable (Québec, 1888). His manuscript memoirs have never been found. J.-G. Barthe, Souvenirs d’un demi-siècle; ou mémoires pour servir à l’histoire contemporaine (Montréal, 1885). Chansons populaires du Canada, recueillies et publiées avec annotations . . . , Ernest Gagnon, édit. (2e éd., Québec, 1880). 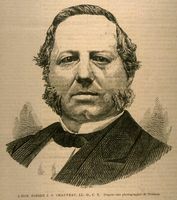 H.-R. Casgrain, Œuvres complètes (3v., Québec, 1873–75), II: 431–542. Léon Gérin, Antoine Gérin-Lajoie; la résurrection d’un patriote canadien (Montréal, 1925). Séraphin Marion, Les lettres canadiennes d’autrefois (9v., Hull, Qué., et Ottawa, 1939–58), IV. Camille Roy, Manuel d’histoire de la littérature canadienne-française (Québec, 1918). [C.-G. Testard de] Louvigny de Montigny, Antoine Gérin-Lajoie (Toronto, 1926). Mason Wade, Les Canadiens français de 1760 à nos jours, Adrien Venne et Francis Dufau-Labeyrie, trad. (2v., Ottawa, 1963). Camille Roy, “Le centenaire de Gérin-Lajoie,” Le Canada-français (Québec), 2e sér., 11 (1923–24): 780–89. Jean-Charles Falardeau, “GÉRIN-LAJOIE, ANTOINE,” in Dictionary of Canadian Biography, vol. 11, University of Toronto/Université Laval, 2003–, accessed April 20, 2019, http://www.biographi.ca/en/bio/gerin_lajoie_antoine_11E.html.